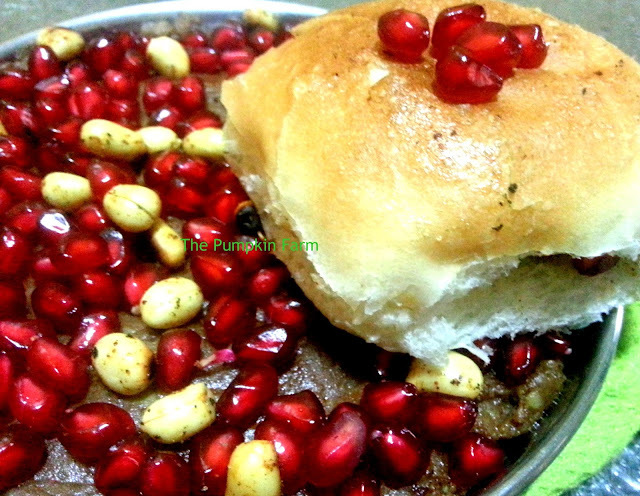 Kutch dabeli swarmed in my life in its original form way back in early 90's. There were small carts that colorufully mounted them next to the bhelpuri or vada pav stalls. The attractively laid out large dishes was surely a sight of visual delight. With times, the carts have become smaller and hence the display, the focus has now shifted to making them more saleable by adding newer twists. While butter dabeli, toasted/ grilled dabelis were common, cheese, schezwan dabelis are also being launched around. I will stick to the basic recipe and share this unusually good tasty., sweet tangy recipe under the street food category for BM..
1) Mash the boiled and peeled potatoes. 2) In a pan, dry roast the ingredients for dabeli masala. Grind them to a fine powder when it cools down. 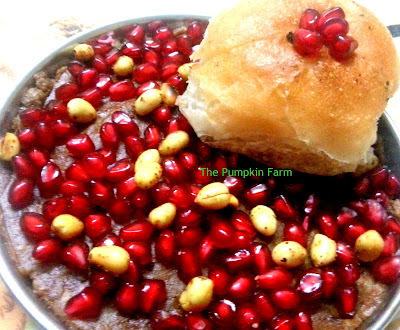 4) In a large pan, heat some oil, add the 4 tbsp dabeli masala and mashed potatoes along with 1 tspn red chilli and salt. Mix well. 5) Take a fresh bun/ pav, slice it from middle. Brush a spoonful of tamarind chutney, add the mashed potatoe mixture, sprinkle with masala peanuts and pomegrenate seeds and coriander. Variations : You may also top this with sev , or toast the dabeli on grill using some butter. Alternatively if you like your food spicy then add green mint or coriander chutney however dabelis are distinctively known for their clove based flavor which is sharp on the tongue and sweet afterwards. Thanks for sharing. I have been looking for an authentic recipe. I remember eating this couple of years ago at an Indian restaurant and loving it. Never tried making at home. Thanks for the recipe, will definitely try it sometime. One of thrall time favorites ...I tend to get it packed..love those ruby pearls..gives it a wonderful crunch. I love this street food, with lots of spices and sauces. Dabeli, feel like inviting myself to ur place..dont make me hungry dear. loved Dabeli... Recently had it with Vaishali ji when I went to Ahmedabad... This looks good!!! When I tasted this the first time in Ahmedabad I fell in love with this..and when I made at home, everybody went gaga over it...truly amazing dish...and you are tempting me again..
Dabeli a fairly new street food which has become a rage everywhere. 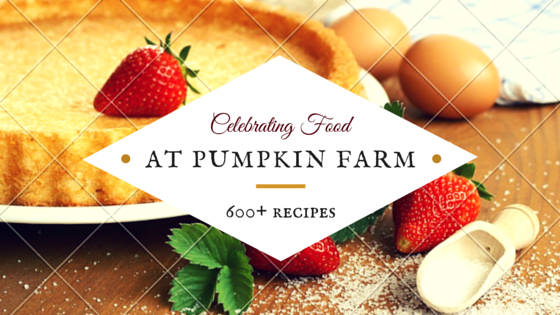 Yours is the classic recipe Which tastes the best. hahah same pinch dear I made the same dabeli too. Its so yumm happy to know that one of my fellow blogger too enjoyed the same dabeli together with me yday . so yum right. I have never tried dabeli but your snap is making me drool..
Dabeli looks absolutely delicious. Never tasted it before..
Looks delicious.. Never had it before. Should give it a try.. Sounds so tempting and authentic! I have never tasted Dabeli before, but heard a lot about it...Lovely recipe! takes me directly to Chembur now, where these yummy delights are to die for :) I am making it this week - thanks for the dabeli masala ! Well you can guess what is on themunu for the next party? Thanks. Wish i could get a huge plate of this dabeli..My all time favourite.